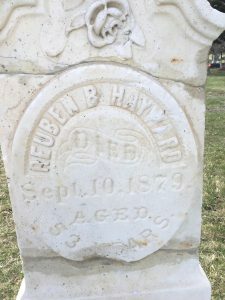 Sarah Hayward and her daughters, 13-year-old Cora and 11-year-old Minnie, watched as Reuben Benton Hayward slapped reins to the bays that pulled his wagon down the lane toward Mount Vernon Canyon. With him in the wagon were two strangers, purportedly dish washers from the Overland Hotel in Golden, who had asked him for a ride to the Rooney Ranch. The date was September 10, 1879, and it was the last time Sarah and the girls would see Reuben alive.